Unless your agency has multiple PPC staff in place, there are many drawbacks to offering it as a service with only one or even a couple of people in-house. How many PPC accounts do you need to employ a full-time member of staff? Depending on the account sizes, it could be quite a few. If that staff member isn’t working close to capacity, it’s unlikely you are making a profit. 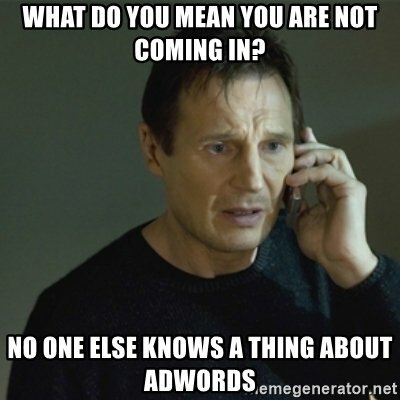 If you only have one PPC person, who covers for them when they are on holiday? Or do you just let the accounts run without being monitored properly? Unless you work in PPC full-time, you are going to struggle to keep up to date with the latest features and techniques. If your PPC person is also responsible for delivery of other work, it’s likely they are not fully up to date. If you only have a few accounts are you being exposed to enough industries and sectors to be able to apply those learnings and innovation across your accounts. Interested in a white label service? Find out more here. Four reasons why expert AdWords help quickly proves cost-effective. On a very simplistic level, setting up a Google AdWords PPC account is not that difficult. Google even offer an easy startup route called AdWords Express which walks you through the process in a 5 minutes. Before you know it, your Ads are appearing on the Internet. Getting them up and running is really just the start of the process though – once Ads are live any advertiser is going to want to improve their performance fairly quickly. WHY? Because every click costs money, and if it wasn’t the right search or searcher you have wasted money. Improving the performance of an AdWords accou..